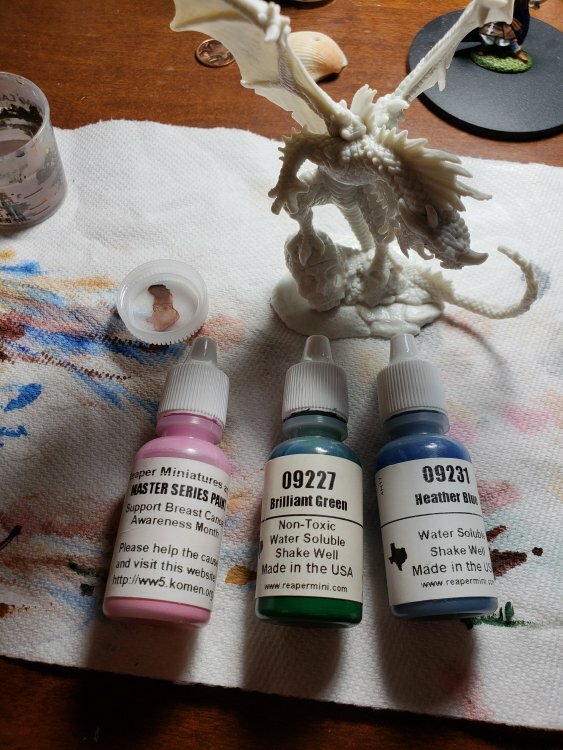 I'm a bit of a glutton for punishment, so have managed to talk myself into another rainbow dragon... Since I have ol' Pathfinder Red sitting in the Drawer of Doom and no real plans for him, I thought I'd randomize him (not that I don't have enough other projects that haven't been finished (or even started)).. 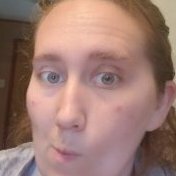 Tertiary: Heather Blue (do not have this, but do have a Sample bottle from a past order that is very close and will be used in its place.. 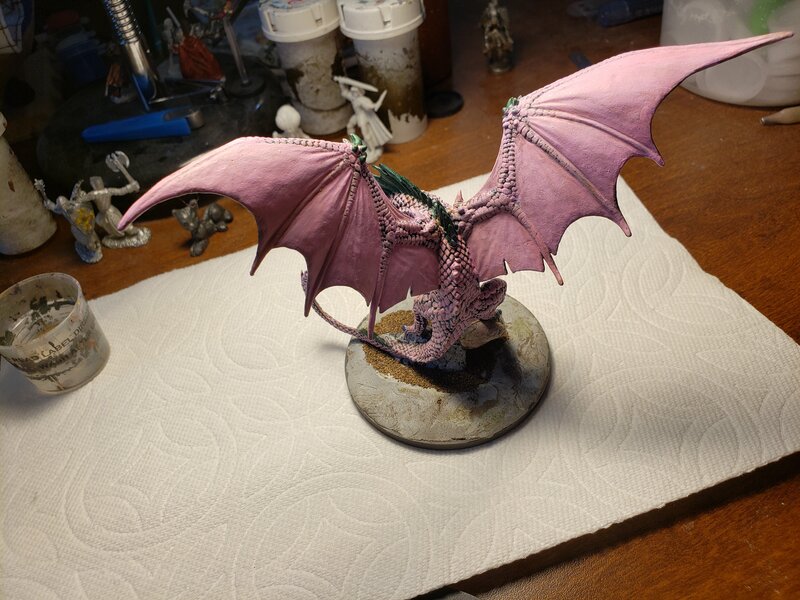 I smidged some paint on a sheet of paper for comparison and have decided that Blush Pink is much brighter than BCPink, so I'll probably use the Blush (unless I decide to go thematic again and donate this fellow to a survivor since I know a few). Also, Forest Green is indeed way too dark to substitute in for Brilliant Green.. Here he is in all his boxed plasticky glory! Right on! Adding you to the WIP list again! Looks like the original pictures got munged in the forum problems over the summer... but anywho, it took a year to get here, but I've finally unboxed him and will most likely get started this week. 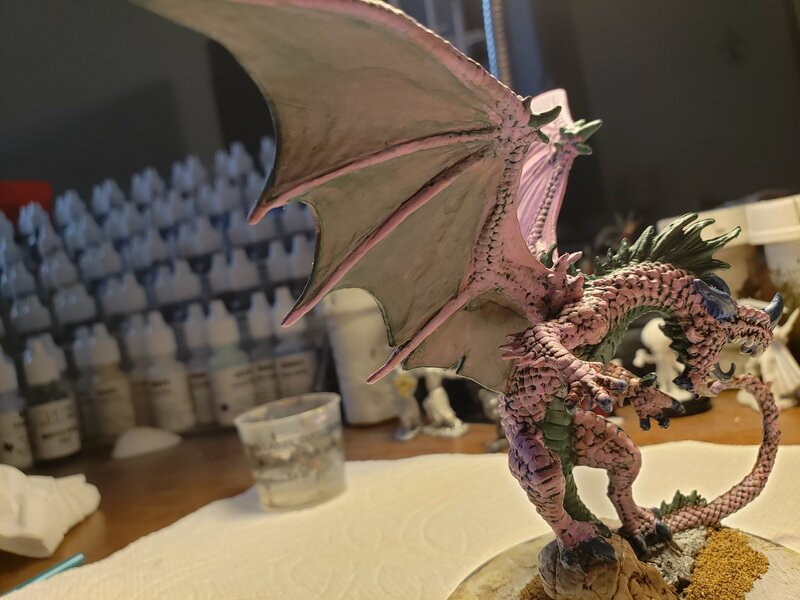 Here he is all glued and stuff - I didn't see too many crevices that pre-assembly would interfere with painting on, so I went ahead and did that first - with the colors rolled..
Whooo, random dragon action yay! ...which reminds me, I should get back to work on mine! 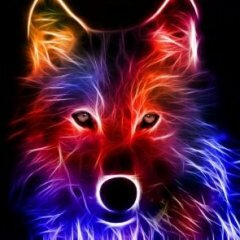 Those are actually great colours to work with! So I was looking at this fellow this afternoon (no, I haven't started anything yet other than his bath and the aforementioned gluing).. Since this contest came into being, I've discovered liners as base primer for Bones figures .. would a base coat of Red Liner (09307) violate the 3* ness of things? And he's already getting a simple green bath.. 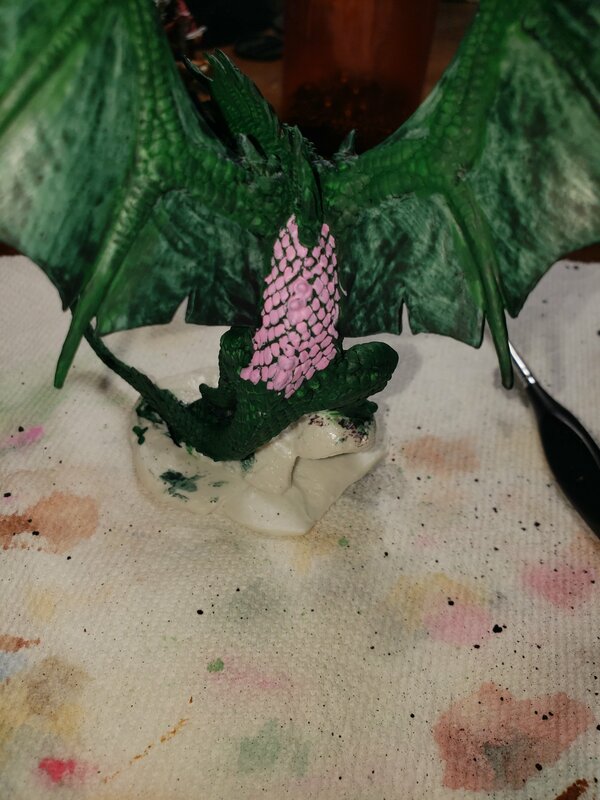 I lined in Red Liner, then tried a Brilliant Green wash, trying to get into his cracks and crevices between the scales ... then promptly dropped BCPink right on top of that, completely hiding the Brilliant Green..
After his bath, he'll get his liner base-coat back, then the green wash, then we'll try drybrushing the pink onto each scale to see if that works better.. I'm worried that the Red Liner is going to be too dark and that the Green will get lost in that darkness,but there aren't really any lighter liners available.. Even Grey Liner is pretty dark. 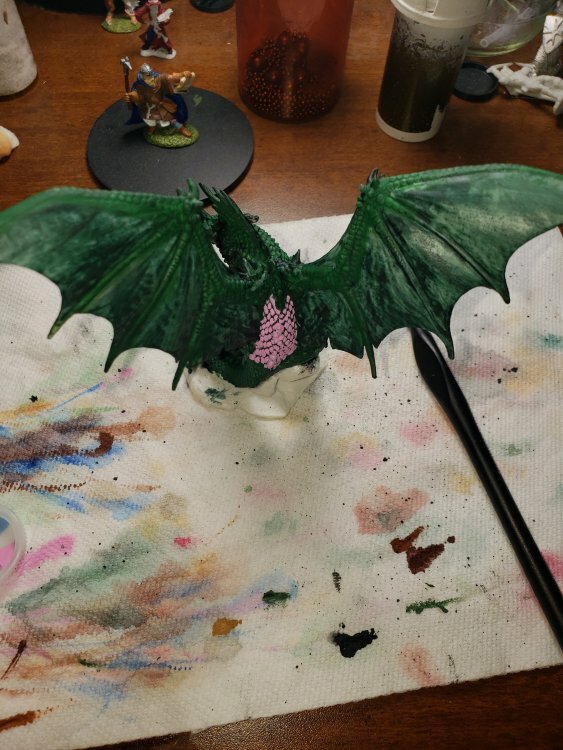 His bath is complete and this time around, I primed with Green Liner, then laid down a fairly solid layer of Brilliant Green on everything but the wing sails. 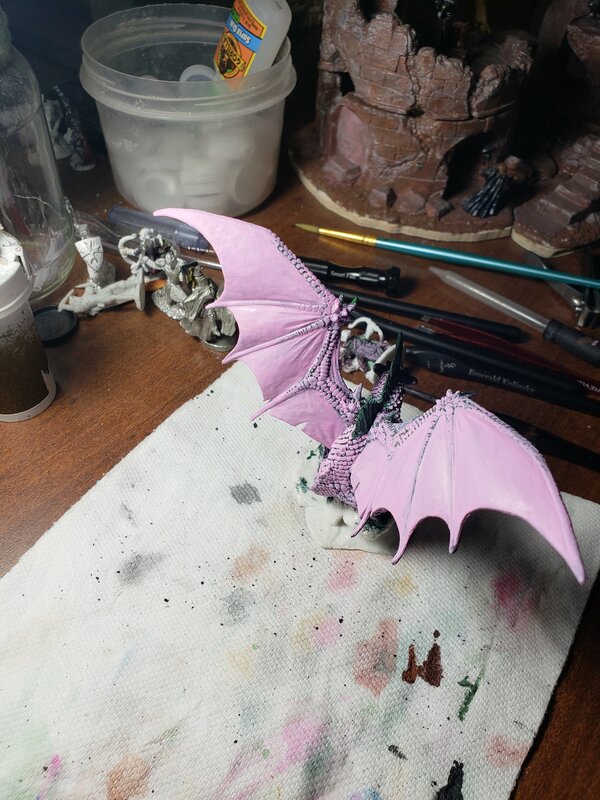 Now I've started hitting the scales with BCPink.. my back started bothering me about 20 scales in, so that's all she wrote for tonight, I think..
First 5 or so layers on the wing membranes.. I'm kind of feeling like green between scales clashes and makes it look like I just wasn't being thorough.. 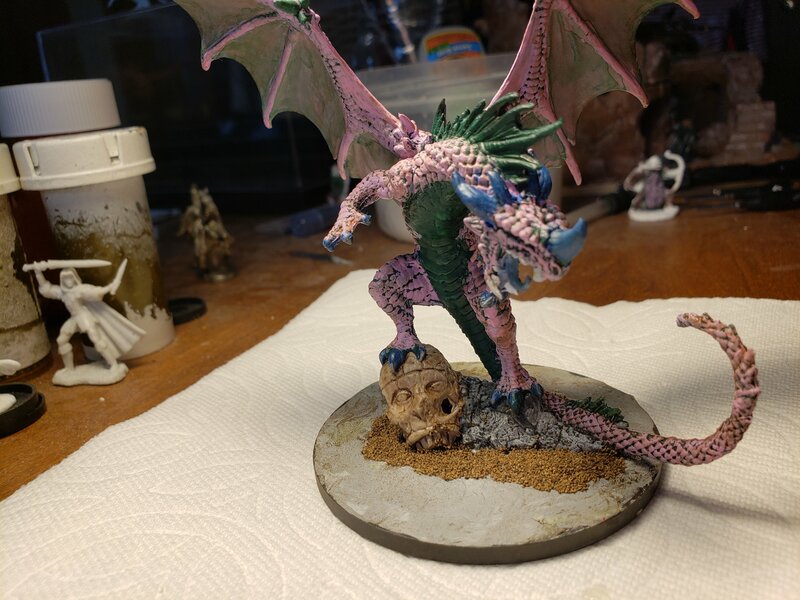 The plan was to have the Brilliant Green in the cracks and crevices, most of him BCPink and use the Heather Blue for horns, spine tips and claws.. I smell a watermelon dragon. Although, I think blush pink (which was the original roll) would have been a better pink for watermelon flesh.. So .. I'm no good at updates, apparently.. 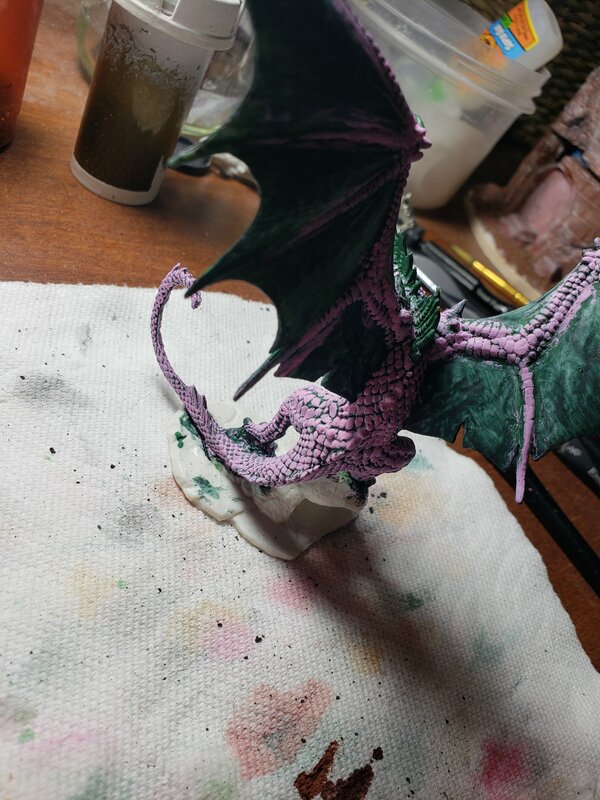 I finished painting him about a month ago and have been procrastinating basing until this week.. 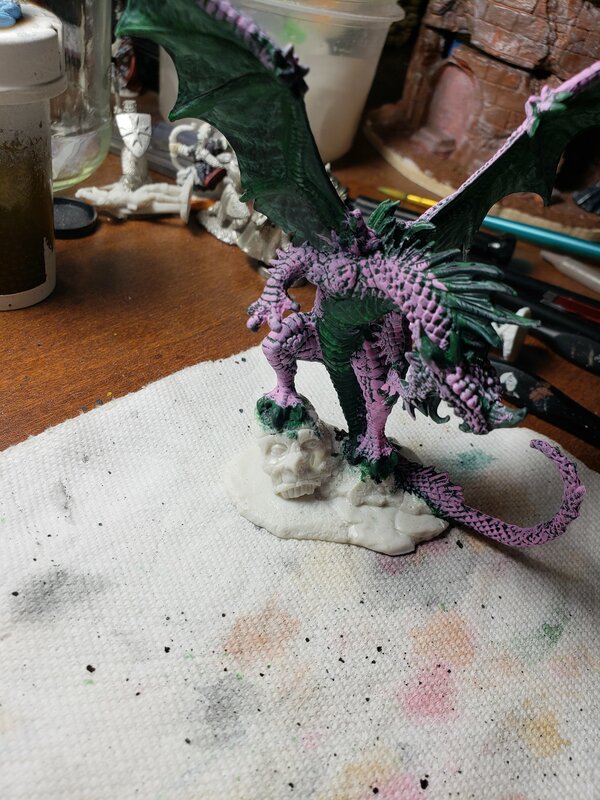 So, here's a few pics of him with his base started.. I decided to go for a sandy-beach look - the plumbers epoxy part will eventually be done in bluish with a cover of water effect after I finish the sand..
and Done! Show-off thread is showing off..